The Marsh Patrion Plus large character printing system is designed to meet your increasing needs. The printer technology in this system has a rare print head flexibility that allows you to meet a number of production line applications with the adaptability to print dot matrix or fully formed, high-resolution characters from one printing system. The Unicorn product family is a compact complete solution for single and dual line case coding. It is made for customers who value quick set-up without technical intervention. One box contains everything needed to start printing today. 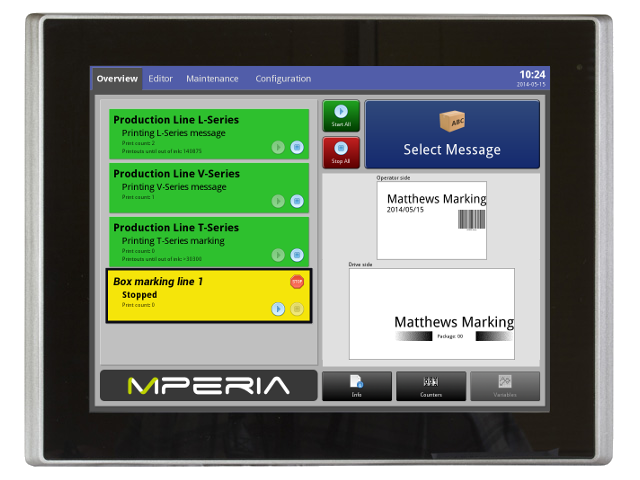 The MPERIA™controller was designed as a universal platform for various Matthews print technologies. You can now manage messages and settings for multiple printers across one or several production lines or packaging locations. Best of all, MPERIA™ is scalable, allowing your business to grow without impacting your marking system. The VIAjet V-Series large character drop-on-demand (DOD) marking system is specifically designed for challenging industrial applications. The VIAjet V-Series features Matthews’ DOD valve technology that marks on porous and non-porous substrates including metal, paper and pulp, wood, concrete, and plastic. The DOD 8400 is Matthews’ new small and large character ink-jet printer, perfect for in-line marking of one to five lines, at speeds up to 780 fpm. Designed to achieve more consistent, higher-quality marks at faster speeds, the 8400 is certain to be our most reliable system to date. Simple and expandable. That’s the base of our I-Mark line of large character ink jet printers. Matthews designed the SX32e to be a small unit that is easily mounted and easy to start-up, with a simple and intuitive interface. Contact our sales team about the right large character inkjet or laser solution for you.